I hope you all had a great time this Independence Day! I know I did. Maybe a bit too good, actually. I paid for all the food I ate and, uh… beverages I drank the next morning. Not feeling so great, I decided to stay home Saturday and just rest. Sitting in my favorite chair and thinking about the previous night’s festivities, I couldn’t help but feel a little melancholy about other good times I’d had and the music which defined them. For example, back in the early ’80s I remember tagging along with my older cousin, her boyfriend, and their friends. We’d go to the arcade (those long forgotten places where kids used to go to play video games before there was such a thing as Xbox), the water park, or the movies, and no matter where we went the entire trip there would be filled with music from her favorite band, The Police. Then, only a few years later, came a song that, for me, defined a decade; my decade. Puberty, girls, parties, and high school; the 90’s had arrived! In the late 80s, hair bands such as Poison, Motley Crue, and Def Leppard dominated the music scene, and though it wouldn’t be long before a couple Seattle-based bands would take music in a completely different (and awesome!) direction, 1990 produced one more iconic power ballad. A song that also just happened to be playing in the background at a party during my first, um… meaningful “romantic encounter.” Thank you, Damn Yankees! Though the rest of my teenage years would still be full of good times and great friends, there was also angst, confusion, and even anger. Nothing new, of course, but it was new to me and the 90s gave my generation the perfect opportunity to express those feelings of disenfranchisement through music… and combat boots. Enter, “grunge,” and one of my favorite bands of all time, Nirvana! High school dances became flannel-clad moshpits and we never had a better time being pissed off. So what songs and music genres define your younger days? Which artists and tunes bring back memories of old friends and good times? Let us know in the comments. Also, be sure to like us on Facebook and download the free Sing-N-Share app for your smartphone or tablet if you haven’t already! It’s a free, easy way to relive those music-filled good old days. On April 10th the Rock and Roll Hall of Fame inducted its newest members. Icons such as Nirvana, Peter Gabriel, Hall and Oates, and Kiss (full list here) were immortalized and guaranteed “legendary” status. Not to be outdone, the world of country music celebrated their own legends earlier this week by inducting Ronnie Milsap, Hank Cochran, and Mac Wiseman into the Country Music Hall of Fame. Mac Wiseman was the second inductee of the the morning. The legendary bluegrass singer and a 70-year veteran of the music industry stated how honored he was to be inducted in the same year as his friend, Hank Cochran. “I hope I will prove worthy of the honor,” he stated. “I can’t say how pleased I am [to be inducted] in the same year as Hank Cochran.” Wiseman accepted the nomination from a wheelchair due to post-Polio Syndrome, but claimed to be in good health and definitely appeared to be in good spirits. Last, but certainly not least, was the six-time Grammy Award winner Ronnie Milsap. Blind from birth, Milsap refused to let his disability stand in his way. He took the country music world by storm in the 1970’s and 80’s and garnered forty #1 hits, placing him third all-time to George Strait and Conway Twitty. The world of country music is all the richer thanks to these three legends and their induction into the Hall of Fame is the least the industry could do to show such well deserved appreciation. Congratulations, gentlemen! It was truly a night to be remembered. The 29th Annual Rock and Roll Hall of Fame Induction Ceremony honored Hall and Oates, Cat Stevens (Yusuf Islam), Peter Gabriel, Linda Ronstadt, KISS, and Nirvana at the Barclays Center in Brooklyn. The night was full of nostalgia and recognition of the newly inducted artists, but it was clear that Nirvana stole the show. It was the reunion everyone had been anticipating. We had only seen it once when the grunge band teamed up with Paul McCartney in 2012 during a benefit for the victims of Hurricane Sandy. Last night, Nirvana reunited on stage for the second time since the suicide of frontman Kurt Cobain. Yes, it was a big deal. The performance of the night featured surviving members Krist Novoselic on bass and Dave Grohl on drums, along with guitarist Pat Smear. Who would fill Kurt Cobain’s shoes? Rumors swarmed after a picture of Novoselic’s bass, Grohl’s drumkit, Smear’s guitar, and Joan Jett’s stickered Melody Maker was shared on the Foo Fighters’ Instagram page. (Clever hint from Dave Grohl’s band.) But I don’t think anyone expected an array of women to front the band. 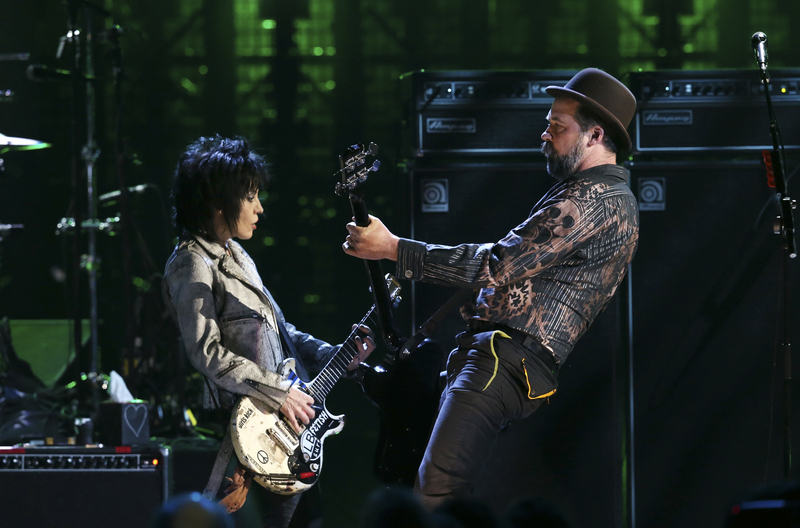 Joan Jett, Kim Gordon, St. Vincent, and Lorde stepped up to perform classic Nirvana songs! Joan Jett kicked it off with “Smells Like Teen Spirit” which instantly ignited the crowd. Sonic Youth’s Kim Gordon was up next. She gave an energetic performance of “Aneurysm.” St. Vincent, who performed a cover of “Lithium” at Chicago’s Riviera last Saturday, took on the song once more. Finally, Lorde led “All Apologies” with the support of the other artists. Nirvana is being praised for their choice of powerful and fitting singers. Job well done, ladies. It was the perfect tribute to Nirvana’s history and influence while honoring the legacy of Kurt Cobain. April 5, 2014, marked the 20th anniversary of his tragic death. This monumental performance and well-deserved induction into the Rock and Roll Hall of Fame seemed to have come at the right time. Now who’s ready for the Kurt Cobain musical, biopic, and documentary? We know we are! 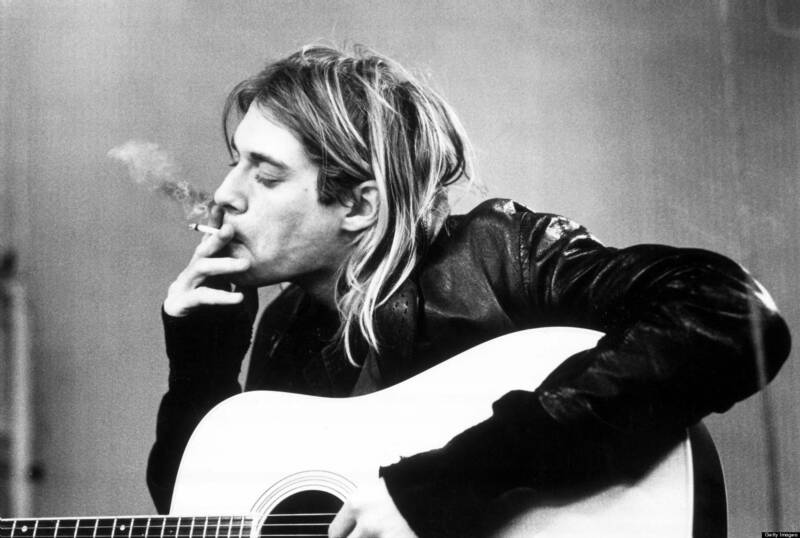 Are you ready for a Kurt Cobain musical on Broadway? Nearing the 20th anniversary of his death, Nirvana frontman Kurt Cobain is being remembered by many. Nirvana will be inducted into the Rock and Roll Hall of Fame Thursday, April 10. That same day Hoquiam, WA will celebrate its first Nirvana Day. On his birthday in February his hometown of Aberdeen, WA held a Kurt Cobain Day, which included the unveiling of a rather bizarre crying statue. 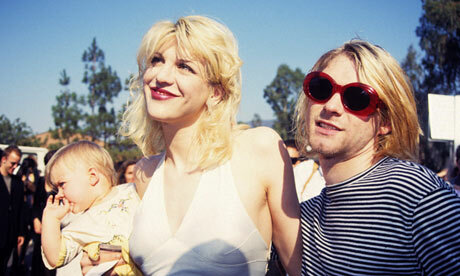 The late singer’s wife, Courtney Love, and daughter, Frances Bean Cobain, hope to honor Kurt in a major way. Love recently announced she has plans for a biopic, documentary, and play. According to Love the chances of a Broadway musical are high at this point. Grunge band Nirvana rose to success in the early 90’s. Despite only releasing three studio albums, Nirvana is considered an iconic rock band due to their impact on contemporary music and American culture. Unfortunately their run was cut short following the death of Kurt Cobain. After struggling with addiction and depression, Kurt committed suicide on April 5, 1994. Does this have the makings of being a worthwhile production? Share your opinion in a comment below. There is no doubt that Pearl Jam’s presence and style has matured over the last two decades, but with riffs from original guitarists Stone Gossard and Mike McCready and the stirring vocals of front man Eddie Vedder, “Lightning Bolt” brings back memories of cargo shorts, flannel shirts and unkempt hair. Thanks in part to Pearl Jam’s stellar rise to the top of the rock industry, other bands stormed onto the scene, further fueling teenage angst and insuring that grunge (sometimes referred to as the “Seattle sound”) reigned supreme as the most popular music genre of the mid-90’s. The late 90’s saw the premature decline of grunge with many of the more prominent bands breaking up, not to mention the tragic death of Nirvana front-man Kurt Cobain. This gave rise to what many called the “post-grunge” era which saw the birth of more commercially viable groups such as Bush, Matchbox Twenty, and Nickelback. Regardless of how you would classify today’s music era, Pearl Jam is still here and still rocking hard. 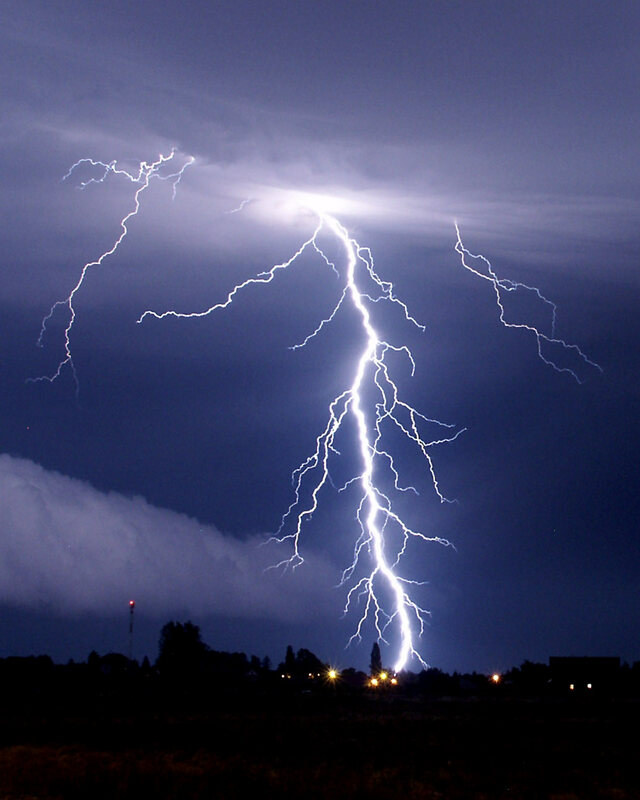 Get “Lightning Bolt” on Amazon.com or iTunes and be sure to check out Karaoke Cloud and KaraokeOnVEVO, where you can sing along with thousands of your favorite tracks from all genres!